Despite the current recession, the frequency of second home ownership is still surprisingly high throughout the western world. While the UK and Ireland previously had lower occurrences of multiple dwellings compared to the rest of Europe, they are quickly catching up with a current surge in the ownership of second homes. The recent MP expenses scandal in the UK has also drawn attention to the prevalence of second homes (or more) within the middle classes, and the fact that the concept is becoming increasingly popular. Chris Paris uses this text to address the reasons behind why second homes are becoming more popular, both within the usual domicile of the individuals, and in international locations. The socioeconomic factors and historical contexts of homes in cultures across the world are fundamental to explaining the choices in transnational home ownership, and Paris’ case studies and comparisons between additional homes in Europe, Australia, America and Asia expand upon the motivation for people to own a second home. 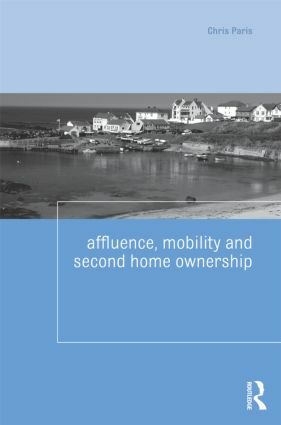 Affluence, Mobility and Second Home Ownership draws together debates on gentrification, globalisation, consumerism, environmental factors and investment to provide a balanced look at the pros, and cons, of second home ownership, and what implications it has for the future. An ideal text for students studying geography, urbanism and planning, this book is also of interest to individuals interested in the changing ways in which we make choices on our places of residence.